Download links to schematic diagrams and technical details for the MicroHunt are provided here. For additional information about the MicroHunt transmitter, inquire directly by e-mail. The MicroHunt transmitter is a complete, 50 milliwatt 2 meter CW transmitter, intended primarily for use in amateur transmitter hunts. It is also suitable for use in amateur rockets / balloons as a ( payload ) "DF homing" or "beacon" transmitter. 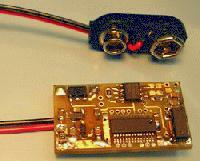 The MicroHunt transmitter uses a PIC microcomputer to generate a CW ident message at regular time intervals. The CW message and repeat intervals are specified by the customer, and programmed permanently into the micro. Repeat timing for the CW message is crystal controlled, for high precision. This is essential for ( very popular ) "international style" ARDF T-hunts, in which multiple transmitters operate sequentially on the same radio channel, and within range of each other's signals. The precise timing provided by the crystal-controlled micro prevents transmission "overlaps" ( due to timing drift ) that would otherwise cause mutual interference between transmitters, and render a hunt impossible. Using this method, several transmitters can be operated ( sequentially ) on the same channel for MANY hours, with no interference. A typical hunt ( using this method ) would consist of 5 transmitters, each transmitting for 60 seconds, and each repeating at intervals of 5 minutes. In November 2003, Bill Brown ( WB8ELK ) installed a MicroHunt transmitter on an amateur balloon that was launched from the University of Alabama, at Huntsville. It landed some hours later on a mountaintop in North Georgia. The MicroHunt transmitter served as a "beacon" transmitter, and as a "backup" homing transmitter, in case the primary ( telemetry ) transmitter failed. The MicroHunt transmitter performed well throughout the flight, to a maximum altitude of 110,000 feet, and through all temperatures, which reached as low as -70 Centigrade. ( -95 Farenheit ) The transmitter was furthermore recieved by ground stations ( while in flight ) as far away as Bucyrus, Ohio ( by KA8LWR ) while floating over Dalton, Georgia... a range of some 425 miles. My thanks to Bill Brown WB8ELK for his kind permission to publish the MicroHunt performance details of that flight... since this report was recieved, several more flights have been made, with similar results. The maximum theoretical range of a 50 mW signal is actually 700 statute miles, assuming omni-directional antennas at the receiver and the transmitter, a reciever with sensitivity of 0.2 uV, and a clear signal path. At an altitude of 100K feet, the distance to the horizon is about 400 miles, so these ( reported ) ranges are not unreasonable. If the MicroHunt is used with the MH+30 amplifier, and pin 6 of the microcomputer is tied to ground, the MicroHunt will detect this strap when power is applied, and switch to A2 mode, generating a signal with a steady carrier and an AM tone-modulated CW message. The modulation is achieved in the MH+30 amplifer, using a tone supplied from the MicroHunt transmitter. The resulting signal is compliant with international ARDF rules, which specify A2 CW modulation and minimum 1/2 Watt RF power. Each MicroHunt is custom-coded with a CW message, so the user must provide some specific information, with each order. Desired transmit time, in seconds. Desired transmit repeat time, in seconds. Text of short CW "repeat" message. Standard frequency is 146.565 MHz. This is the national T-hunt frequency in the United States. Other frequencies are possible, but may require some extra delivery time, to acquire a suitable ( standard ) CPU crystal to achieve a different frequency. A list of readily available frequencies is provided in the technical download link, below. The list includes all frequencies in the 2 meter amateur band ( 144 - 148 MHz ) in 5 KHz increments, along with the suitable CPU crystals required to achieve those frequencies, with 1 KHz ( or less ) frequency error. The crystals that are normally available "on our premesis" includes 18.000 MHz, 18.432 MHz and 24.576 MHz. Other crystals in this list ( if required ) must be ordered, adding perhaps a week to delivery time. The transmit time refers to the amount of time that the transmitter is actually transmitting a signal. The repeat time refers to the time from the start of one transmission to the start of the next transmission. The CW "repeat" message refers to a text message that is "repeated" over and over during each transmission until it is time to send the "sign-off" message. Typically this is a short group of letters, such as "BCN" or "BALLOON" or "MOE" or "MOI" etc. This message can be sent at 8 WPM ( standard ) or at 15 WPM. The "sign-off" message is a standard CW sign-off, containing the call sign of the station, such as "DE WB6XYZ". This is sent at 15 WPM, just before end of transmission. As an example, international ARDF hunts specify 5 transmitters, each transmitting for 60 seconds, in sequence. Transmitter 1 will ( repeatedly ) send a CW message "MOE", transmitter 2 will ( repeatedly ) send "MOI", transmitter 3 will ( repeatedly ) send "MOS", followed by "MOH" and "MO5" ( repeatedly ) for TX 4 and 5, respectively. In this case, the desired transmit time would be 60 seconds, and the desired repeat time would be 5 minutes. NOTE : For ARDF hunts, the crystal timing used in the MicroHunt transmitters ensures the 5 transmitters will not "drift" into each other's allocated time intervals, for many hours.... drift is typically a second or two after 6 hours of operation. The transmitter timing is initially set by simply turning them on ( connect the battery ) "in proper sequence", at fairly precise times. ( within 1 second ) Since all the transmitters are within range of each other's signals, ( for an ARDF hunt ) this can easily be done by carrying a reciever to hear signals from the other ( previously started ) transmitters. Other CW messages ( not repeated, or otherwise somehow "custom" ) can be used, please specify the desired message if you want this. Bear in mind long messages will require more time to transmit, so the transmit time will be determined ( to some degree ) by the desired message.